Throughout your life, your brain undergoes extraordinary changes. Fascinating physical developments in your brain unlock each new chapter as you grow. And with billions of neurons and trillions of connections, it responds to your experiences to make you the person you are. our brains work, from the minute we are conceived to the moment we die? In a complex, social world, you need to be self-aware, solve problems and use language – and through evolution, your brain has adapted to make you better at this than any other species. All mammal brains, including yours, have an outer layer called the cerebral cortex. But what makes your brain different is the number of neurons in this layer. 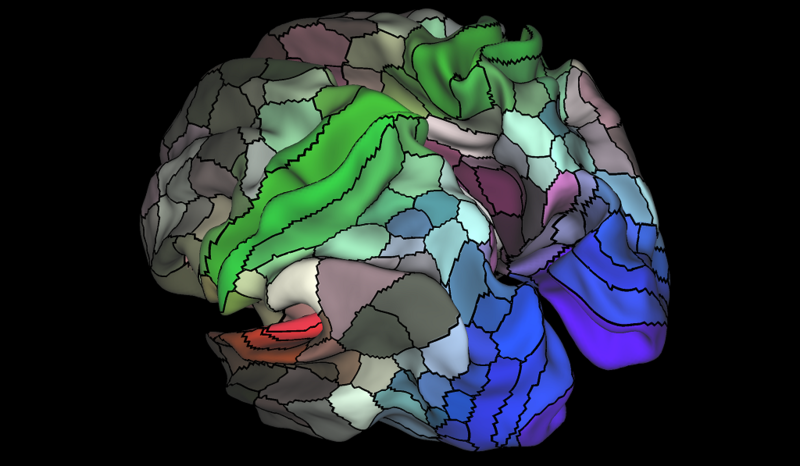 If you spread it out and smoothed all the folds, called sulci, its area would be more than 2,500 square centimetres. The cortex consists of a layer of grey matter containing 86 billion brain cells, with a layer of white matter underneath. This is where the trillions of axons connect your neurons together at junctions called synapses. Even the earliest organisms on Earth had cells that could send and receive signals using chemical or electrical impulses. Over 550 million years ago, in the earliest ancestor of all animals with one plane of symmetry, these cells developed into a simple nervous system with a small brain. Fish gradually evolved brain structures that we still recognise in ourselves – the amygdala which processes emotions like fear, the basal ganglia that controls voluntary movement, and systems that relate to vision, memory and reward. 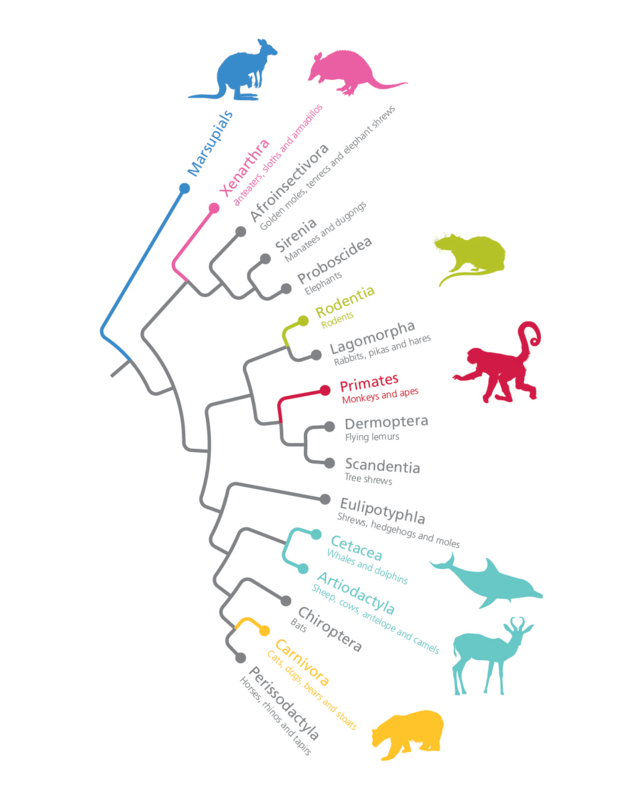 The evolutionary tree of marsupial and placental mammals – the Theria – has been dramatically revised in recent years as a result of new genetic analyses. Mammals branched from the reptile lineage 320 million years ago, on dry land. Their brains grew larger and one group, the primates, developed particularly large brains as an adaptation to living in trees. From this group the modern human brain evolved around 200,000 years ago. It’s three weeks since you were conceived, and your brain has just started to form. A quarter of a million neurons are growing in your head with every single minute that passes. Under the guidance of your genes, you are now forming the brain cells that you will think with all your life, along with cells in your ears and eyes. But your brain will really get busy from the age of twenty weeks until you’re born. It’s building structures and circuits that will lead to the adult you will become. While your brain is developing in the womb, it is already plugged in and switched on. In the womb you can twirl and turn, swimming in fluid. 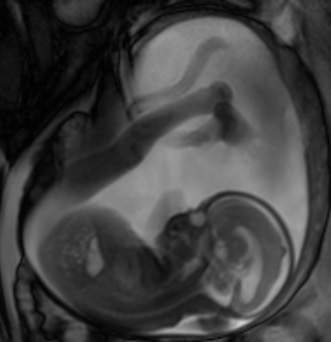 But despite the wriggling, scientists can capture powerful scans of your developing brain. In your developing brain, cells migrate outwards to form six layers in the neocortex, part of the folded outer layer of your brain responsible for learning and memory. Experts used to think migrations stopped at birth. But new research shows that some neurons carry on migrating up to three months after you’re born, triggered by interactions with your environment. We know of no other mammal that does this – and it is an example of the way in which your brain is shaped by experience. Nature and nurture both affect how the crucial connections in your brain form. The cerebral cortex makes up about 80 percent of your brain’s mass. 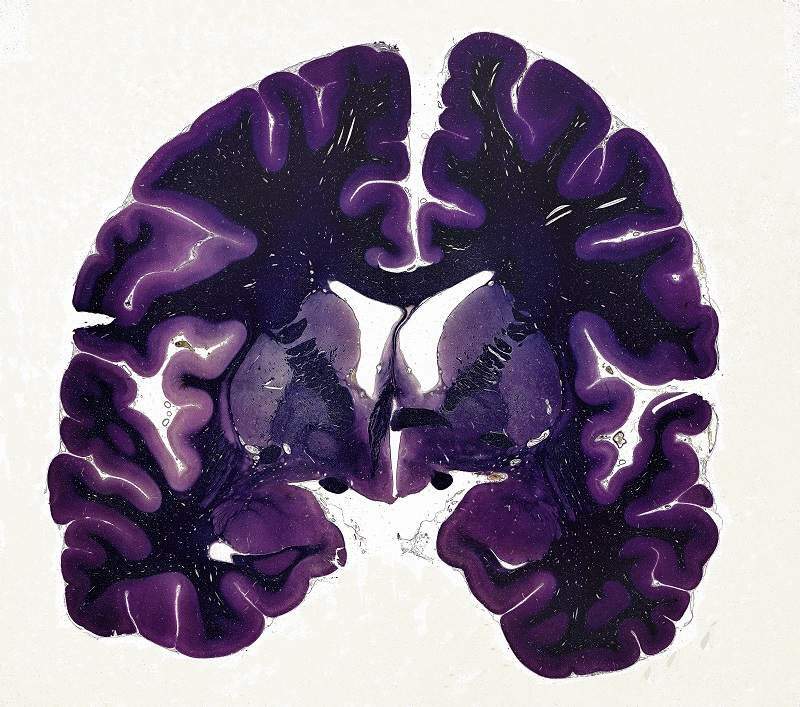 It contains grey matter, predominantly neuron cell bodies (light purple), and white matter axons (dark purple). It is deeply wrinkled in order to fit more neurons into a small space. Every human brain has the same structure. You think primarily with the cerebral hemispheres, the two wrinkled masses that look like walnut halves. Incorporated between them is the limbic system that processes emotion, and beneath is the cerebellum, associated with movement. The brain stem, consisting of the midbrain, pons and medulla, handles life support. But your personality and character result from the particular way in which your brain is wired up. Brain diversity may have allowed us to be successful on the planet, because the different wirings help us to solve all kinds of problems and adapt to changing circumstances. 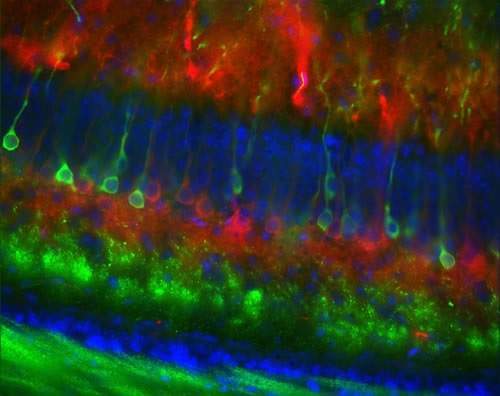 Cells in your developing brain migrate to form six layers in the neocortex, coloured here using fluorescent probes. 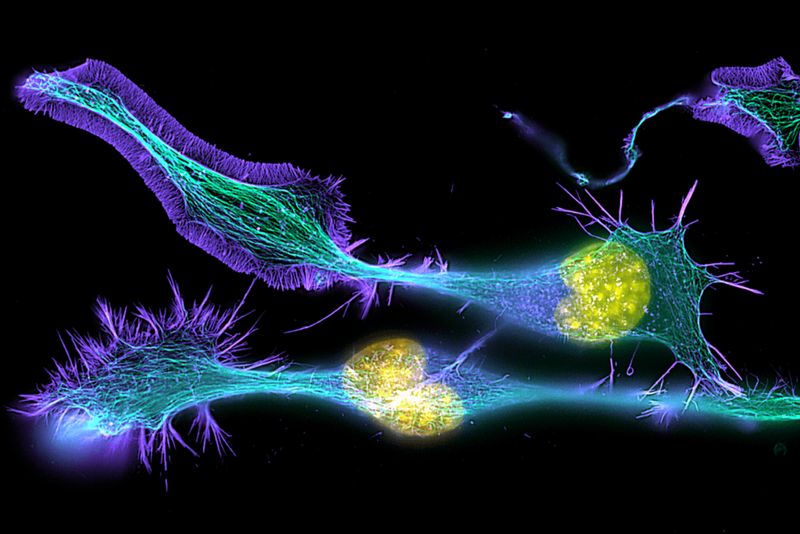 Every cubic millimetre of your brain contains about 50 million neurons, each with a large cell body (yellow) that has long extensions called axons and thin branching structures called dendrites. Electrical signals travel from the axon of one cell to the dendrites of another. You are now in your childhood, and your brain is making up to 1,000 new connections every second. Each neuron is busy sending out extensions called axons that transmit information, and dendrites that take in information. As a result, each neuron in your neocortex ends up with about 15,000 connections, called synapses, by the time you are three years old. You’ll go on learning new things and gaining experience all your life, strengthening useful connections all the time. Learning is all about changes in the brain due to experience. Our neurons are continually growing and retracting new spines to test if it’s worthwhile making a new connection. When the signal reaching a neuron is strong enough, it triggers the next neuron to transmit the information. All your thoughts, actions and emotions involve a living network of brain cells and chemicals. 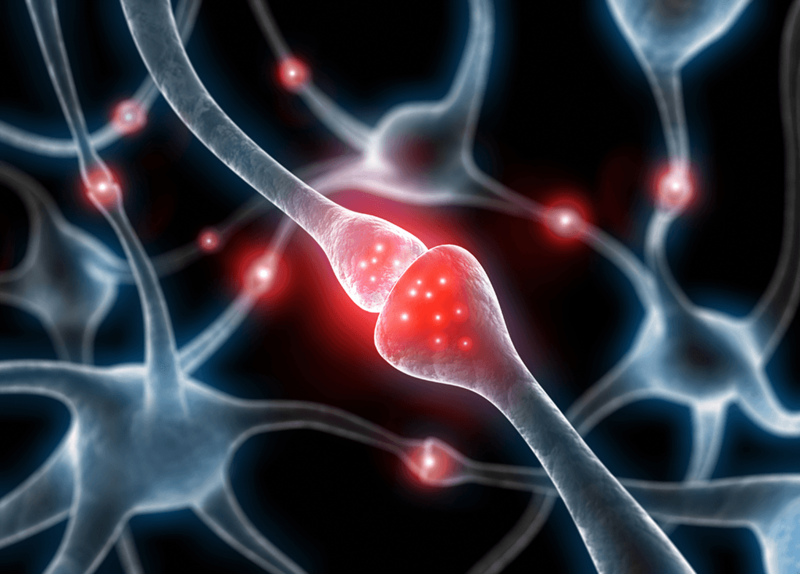 Neurons pass on information using electrical impulses that release chemicals called neurotransmitters at the synapses. When the chemical signal is strong enough, the next neuron is triggered and transmits the signal. This communication is the basis of circuits within and between brain regions that enable you to learn language, recognise patterns and instruct your body to carry out intricate tasks. There is a lot of understanding of the single neuron. Now the effort is going into understanding the circuits. 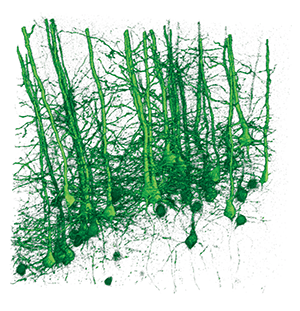 We want to know what the networks of neurons are doing. 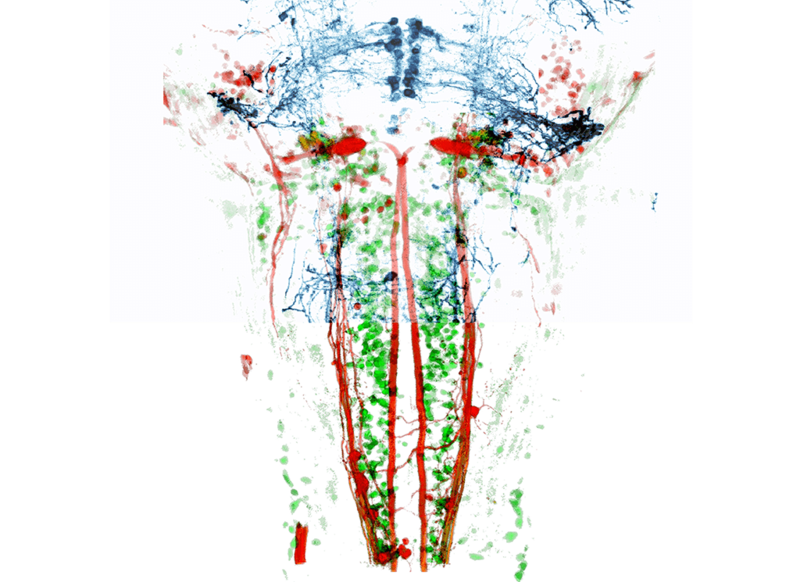 In this zebrafish brain, scientists have identified the circuits of neurons responsible for its behaviour when escaping danger. Psychologists and neuroscientists at the University of Oxford are working together to research how children’s brains recognise and process words. By studying how the brain responds to different types of words during a variety of reading tasks we are beginning to understand the complex neural circuits that serve our ability to read. The Word Detective game below is based on a lexical decision task used by scientists in this research. 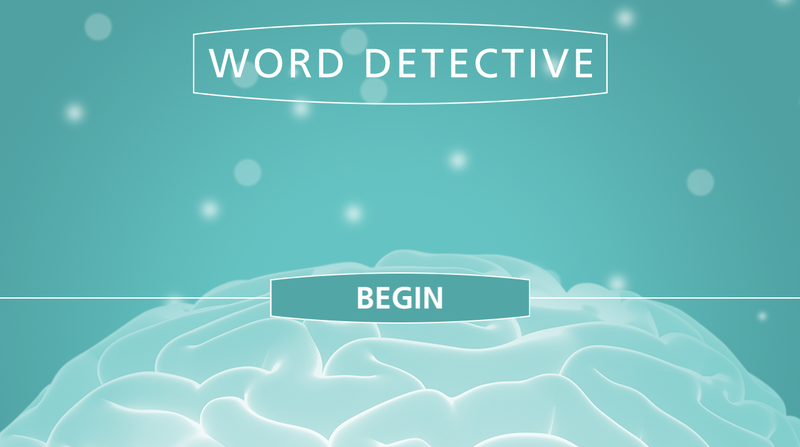 Word Detective is based on a lexical decision task used by ReadOxford, a research group in the Department of Experimental Psychology at the University of Oxford. The game is not part of the research project and responses are not recorded. In the Word Detective above some made-up words sound like familiar words - such as ‘brane’ and ‘brain’. When asked to sort real from fake words in this type of lexical decision task, people are generally slower to reject familiar-sounding fake words than those which don’t sound real. This tells us that as we read, visual word forms activate speech areas in the brain, and this feeds into our decision-making when deciding if a word is actually real or not. When you learn, connections between your neurons are strengthened along the elaborate branching structures that link them. Image: Yinghua Ma and Timothy Vartanian, Cornell University, Ithaca, N.Y.
You have now reached your teenage years. How do you feel? Your brain is at peak performance. Its capacity to think now matches an adult’s, and its ability to learn will never be greater. 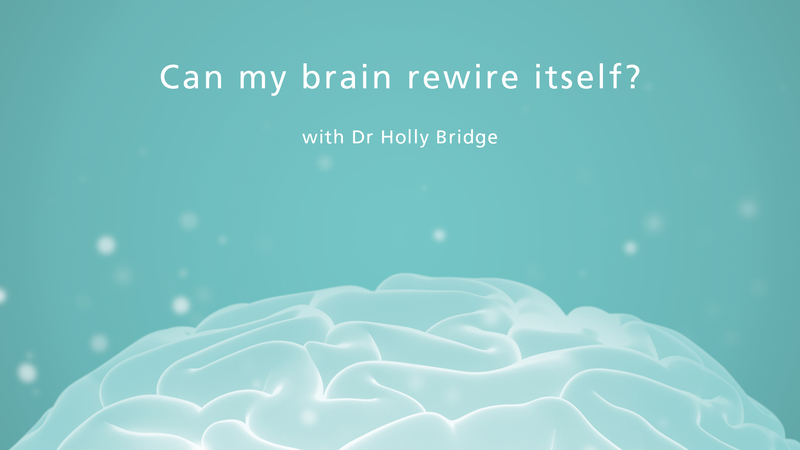 During this vital period, your prefrontal cortex, an area at the front of the brain responsible for planning and decision making, is undergoing a pruning process in which active connections are strengthened while others are lost. It’s good news for your ability to explore and learn, but means you are not yet able to take rational control of your limbic system, which handles your emotional responses. 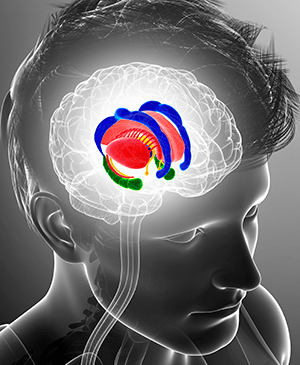 Judging situations requires activity across a network, including limbic areas, shown here, and the prefrontal cortex that is responsible for the rational control of emotions. As the prefrontal cortex matures in its connections, teenagers get better at reading social situations and understanding other people’s emotions. 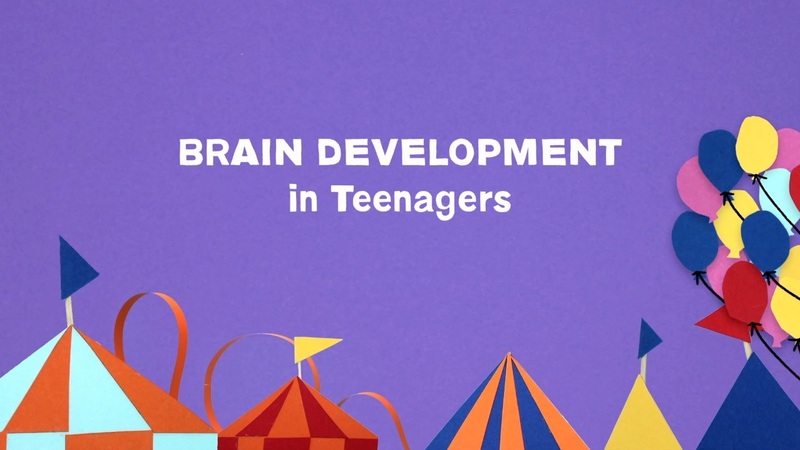 During adolescence it can be hard to read emotions and social situations because the brain’s connections between areas like the amygdala, in the limbic system, and control regions of the brain are still developing. Teenagers’ initial reactions to social scenarios are often emotional, but an Oxford study showed that by asking adolescents to re-evaluate a social scene, their brains’ control circuits came into play, allowing for a more rational assessment and interpretation. This kind of re-evaluation is an important tool in helping adolescents cope with anxiety. 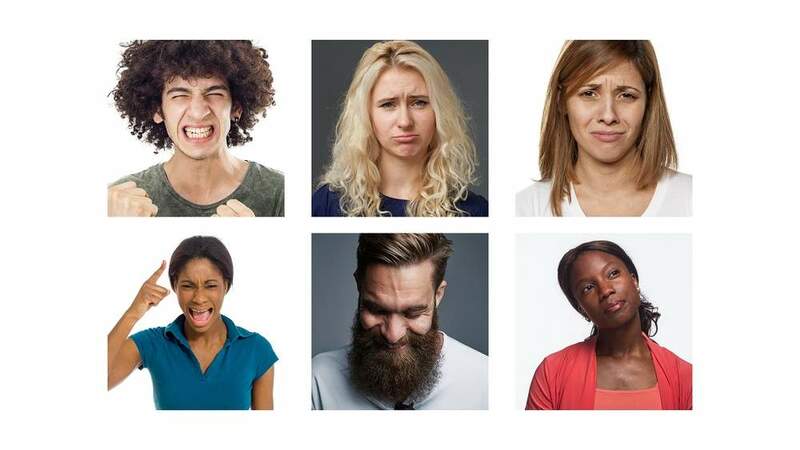 What emotion would you associate with each of these faces? Your brain won’t be fully developed until you are in your mid-twenties – much later than experts once thought. It’s busy throughout adolescence completing a huge housekeeping project that started in your childhood. The number of connections between brain cells drops by half as the brain clears away unused pathways. The remaining connectors develop a wrapping called myelin that increases the speed at which they can send signals. This fatty white substance gives them the pale appearance of the brain’s white matter. Synapses are the junctions between one neuron and another. In pruning, your brain weeds out unused or weaker synaptic contacts and keeps stronger ones, leaving you with reduced synaptic density. Sleep is critically important to good health and a positive mood. 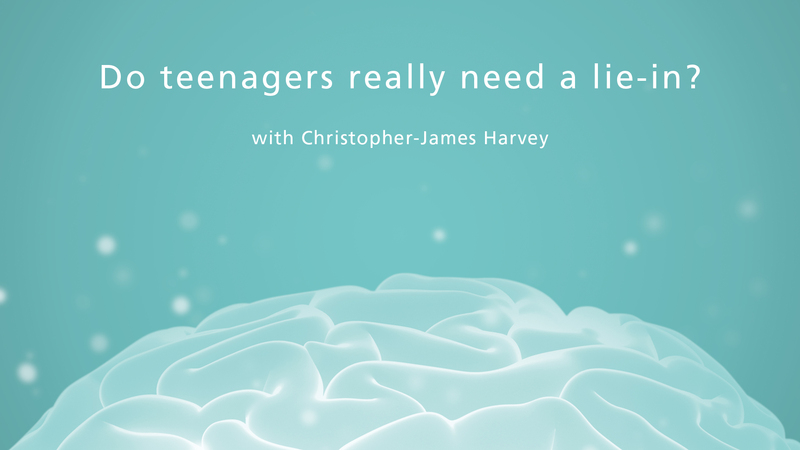 But between the ages of ten and 21, changes in the brain can get your sleep patterns in a mess. Experts don’t know exactly why, but the internal clock that controls sleepiness runs up to three hours late at this time of life. What’s worse is that you probably need nine hours of sleep, instead of an adult’s eight. Some schools have decided to try starting the school day later to see if it improves students’ alertness, memory and learning. During sleep, your brain consolidates memories, and does a lot of housekeeping: managing and recycling proteins that would otherwise start to build up. Now that you’ve reached 25, the pieces of your brain’s complex puzzle have fallen into place. From the visual area at the back of your brain, to the prefrontal cortex handling control and planning, all the functional areas are mature. Some days you may feel more on-the-ball than others. However, it’s a myth that you use only ten percent of your brain capacity. Scans show your entire brain functioning even while a specific part is particularly active. And new research is revealing much more detail about which areas do what. 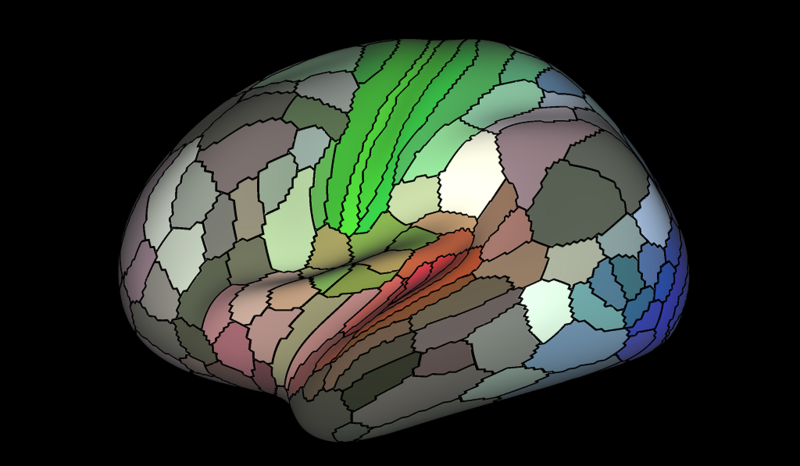 Your brain’s cortex has 180 specialised areas in each hemisphere, according to new functional magnetic resonance imaging scans analysed in the Human Connectome Project. Red areas relate to hearing, green to touch and blue to vision. 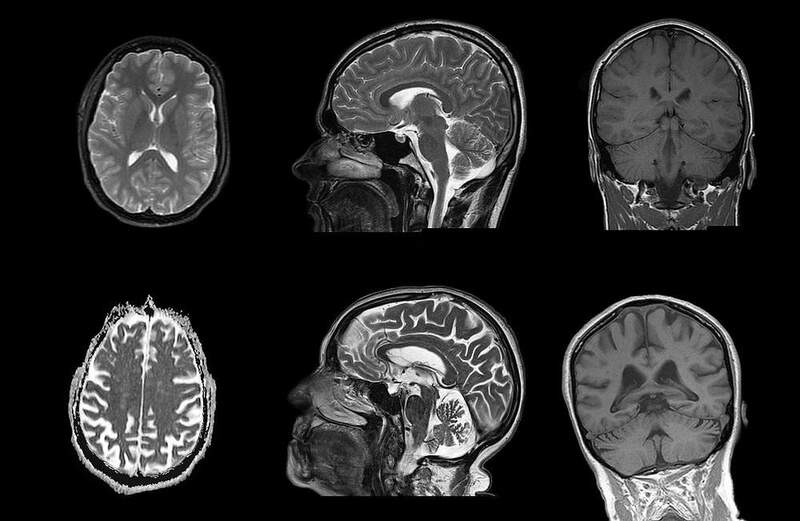 By using a computer algorithm to match data sets from different scanning methods and conditions, scientists can identify more detail than ever before about the function of different brain regions. Your senses have been fully functional since you were young. They use an army of detectors in your eyes, ears, nose, tongue and skin to gather signals from the world around you. Each part of your retina, the light-sensitive layer at the back of your eye, links to a location in your visual cortex. Signals travel along neural pathways, creating a representation of what you see. In a similar way, your entire skin surface maps to areas of your thalamus and parietal lobes so that you can tell where and how a sensation originated. But new research is revealing a surprising crossover between many senses that is still under investigation. Vision is the dominant sense in humans. We have specialised brain areas for dealing with things that are moving, or which correspond to certain objects. Scientists don’t fully understand how senses cross over in the brain, but in mice, they have discovered a direct connection between the ear and part of the brain that deals with smell. 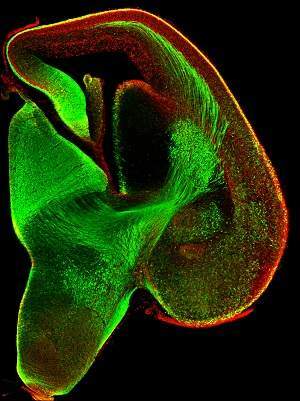 The image shows a mouse brain developing before birth. Your brain has several chemical routes to making you feel happy. The neurotransmitters dopamine, serotonin, oxytocin and endorphins can all be released by good experiences. However, a win or achievement may not result in the happiness you might expect. Dopamine neurons fire at the anticipation of reward but then reset. It’s as if your brain is tuned to anticipate reward rather than enjoy receiving it – part of its ongoing mystery. Your brain is always waiting for the next thing. Perhaps this relates to how we become motivated to do things – we are wired for activity. 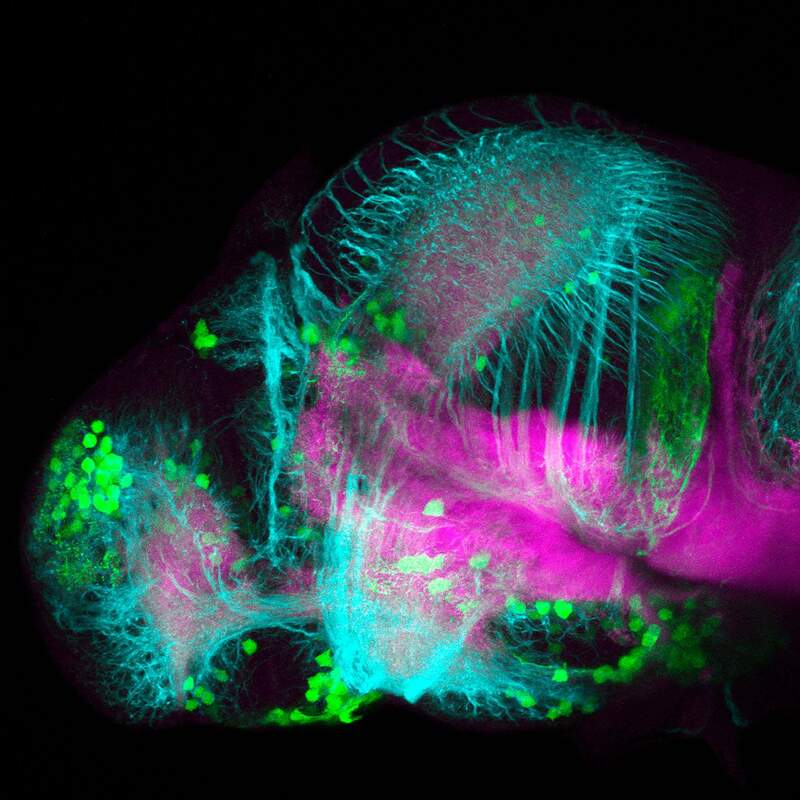 Neurons related to the release of dopamine, a chemical involved in reward, are shown in green in this image of a zebrafish forebrain. At the ripe old age you’ve now reached, your brain has been hard at work for decades. Ever since you were forty, your brain has been shrinking by five percent per decade. Levels of the neurotransmitter dopamine that sends signals around the brain have also been dropping, a normal part of ageing. But there continues to be remarkable power in your brain. Neurons are still building new connections and circuits, preserving your ability to adapt and learn. This property, called plasticity, seems to be best maintained by exercise. Compare the normal brain of a 22-year-old (top) with the scans of a normal 96-year-old. Brain shrinkage is shown by extensive white areas. During exercise, your brain is flooded with oxygen and blood. While we don’t fully understand how, this enables the growth factors that maintain the cells to encourage and guide new connections. 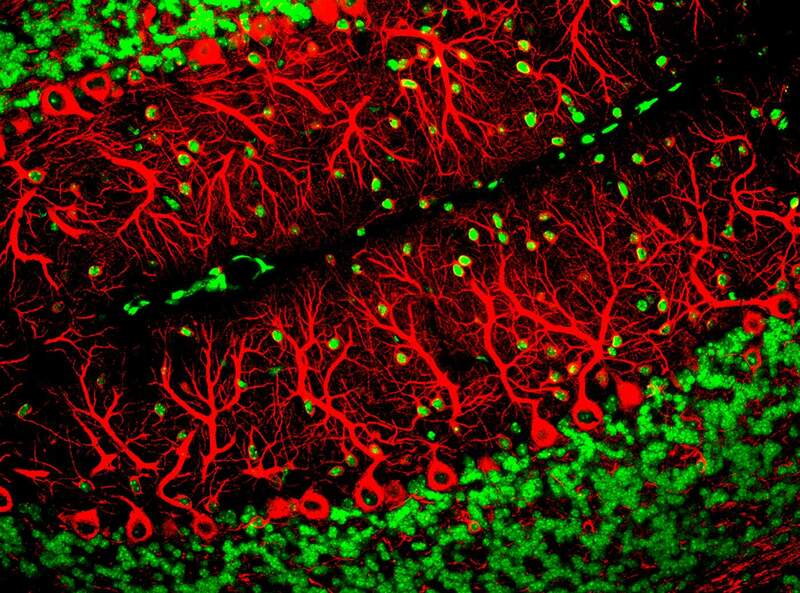 New neurons are born even in the ageing brain – but only in two areas, as far as we know. They occur in the forebrain where they move to the area associated with smell. The other place is in the hippocampus where they may have a role in the formation of new memories. Whether the cells flourish and integrate into their new brain areas does seem to be influenced by genes. However, there is also evidence that mice which exercise and have new experiences see fewer brain cells dying off. Before birth, neurons develop from cells called progenitors, as highlighted here using different fluorescent colours. But as an adult, you still produce new neurons in certain areas. You might be worried about losing memory in old age. Some memory function decreases from middle age onwards, particularly memories of episodes in our lives. However, your memory for facts and meanings increases during adulthood until eventually declining when you are very old. 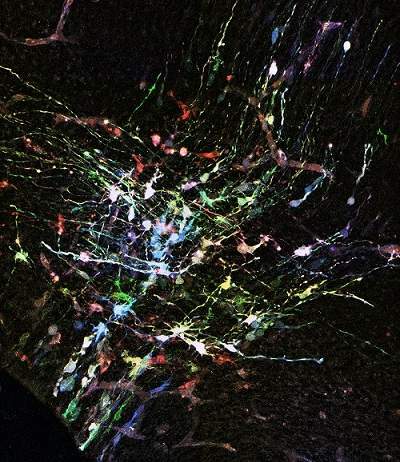 brain cells in mice into light-sensitive switches. Then they can switch the cells on and off using light, helping reveal how memories are stored, could be wiped, or possibly restored. 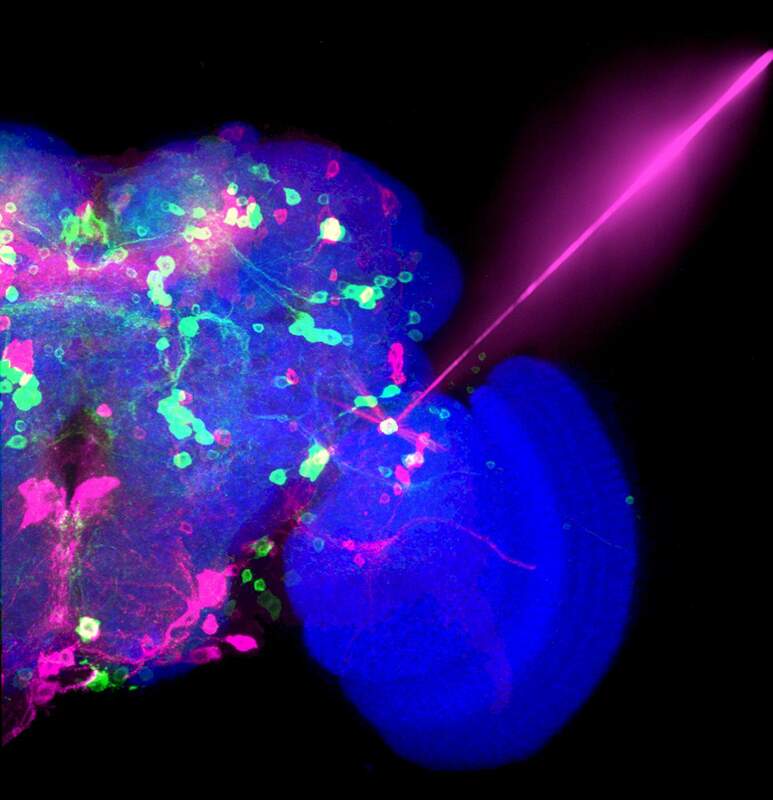 Scientists have engineered the magenta-coloured cells in this fly brain to make them produce a light-sensitive protein. They can then selectively control the activity of these cells by using a beam of light. What’s the secret of staying fit and well into later life? A large-scale study called UK Biobank is hoping to shed light on this question by scanning the brains of 5,000 healthy people aged 40–69. The Biobank brain scans look at the structure, function and neural connections in the brain, providing a huge amount of information for scientists to draw on. This is an example of so-called Big Data, where large numbers of examples can reveal patterns that are otherwise very difficult to see. 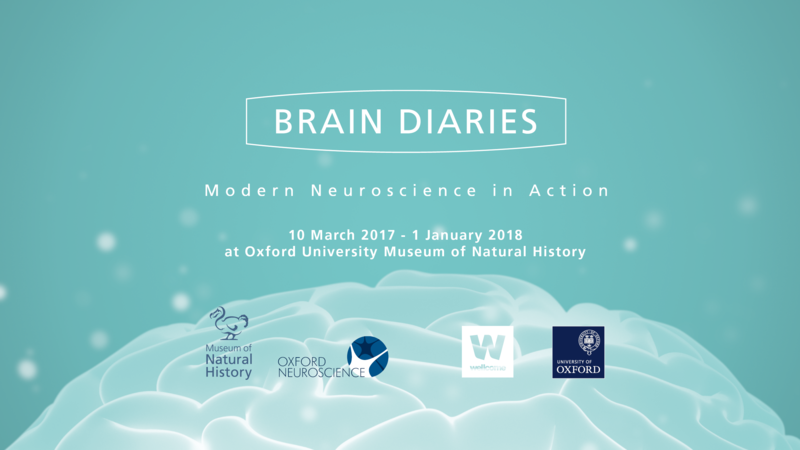 Brain Diaries introduces some of the fundamental developments occurring in the life of the human brain. But there is much that remains to be investigated and better understood in this rapidly developing ﬁeld. 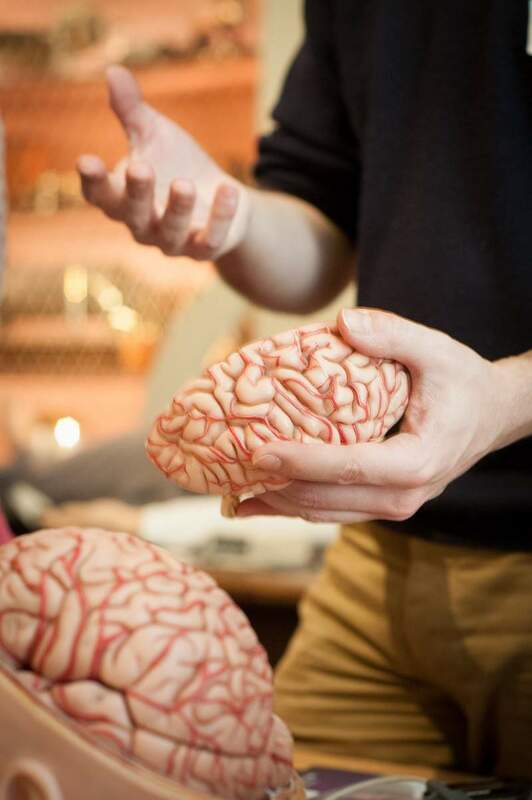 To coincide with the exhibition at the Museum of Natural History an Oxford University research team offered the chance to use state-of-the-art MRI scanners to investigate the brain, asking the public what they would you like to know. 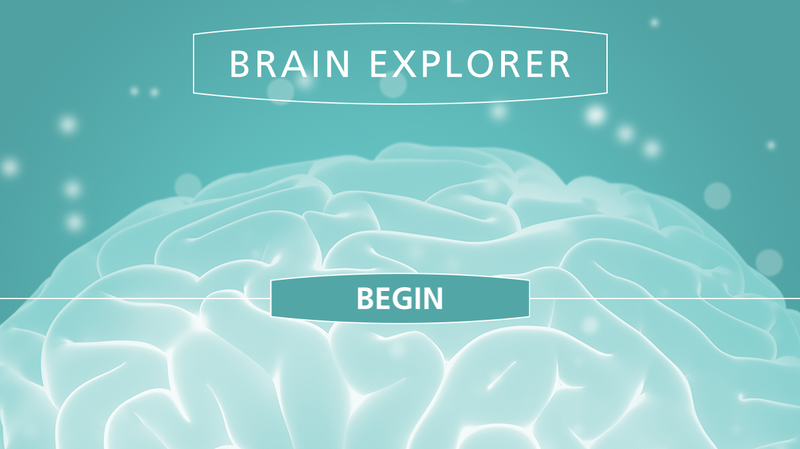 Read about the results of the Big Brain Competition entries here.